Friday pm- Friday am Please contact us on 01398 332094 or info@catherinestott.co.uk for current availability or to book. 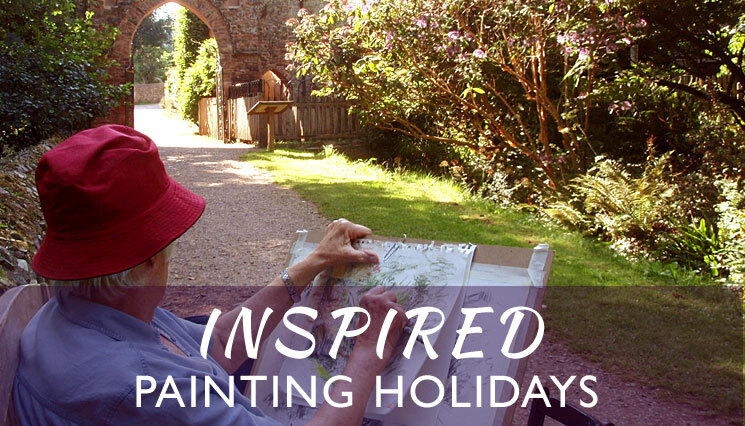 A Painting Holiday Course in beautiful Devon, visiting and painting gardens and beauty spots at the height of summer to sketch or paint in your chosen medium. August is a time of great abundance in English gardens and coutryside; orchards are colourful with ripening fruit, grasses put on a show against the summer landscape. Borders are blooming and walled gardens abound with leafy vegetables and flowers. This is a studio and location based course which introduces and practices skills which will help you to create successful garden paintings. We aim for at least two full days out in some beautiful locations, using them as inspiration for sketching and painting. The timetable runs from Friday evening to Friday morning, with one free afternoon for you to explore the local area. There is time to learn skills for working outdoors and composing a picture with a gradual introduction to working from outdoor subjects. We will cover sketching, tonal values and composition, negative painting and colour mixing. Students bring their preferred choice of painting medium and receive individual advice on use of materials and painting skills; you may wish to use the opportunity to try out a new medium with a tutor to guide you. Materials	Please bring sketching materials including charcoal, sketchbook, and painting equipment for your chosen medium. Most non- solvent based media can be used on this course (eg watercolour, pastel, acrylic)-do contact the artist if you need more advice on materials. Also recommended- protective clothing for painting, suitable footwear and clothes for outside work, including waterproofs. Digital camera. Folding stool if needed. More detailed information about materials and equipment is sent out shortly before the course. You may already have all you need to get the most out of your holiday - we encourage you to contact the artist for more advice, so that you don’t leave behind things that you will find useful, and to avoid expensive purchases which may prove unnecessary. Other costs	Student's lunch/refreshments on visit days. We are surrounded by beautiful gardens many owned by the National Trust or with reduced price entry for RHS members, so bring your membership card if you have one. Courses are based at the Artist's house and Studio in Bampton, near Tiverton, Devon. The holiday is fully residential in our AA 4 star accommodation, and nearby holiday cottage. The residential price includes single occupancy accommodation, breakfast, evening meal (except Tuesday) and lunches except on days out, and all tuition sessions. The non-resident price includes all meals as above except for breakfast.